These days it’s not uncommon to find musical recordings in several different formats. Although the CD is the standard choice for most music fans, some bands, especially those not in the mainstream, may release their latest albums on vinyl only. 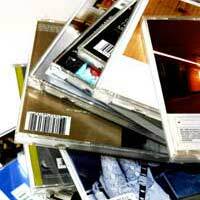 You can usually buy a new album on CD, vinyl, or as a limited-edition CD that is packaged with a book or some artwork. It may even be possible to buy a package that contains all these formats, although this tends to be an expensive purchase. But is there any real value in collecting all the possible formats? The answer to that depends largely on the artist. A few recording artists will sell a large number of CDs and have high critical credibility, like band such as Radiohead. Other artists, like the British singer Kate Bush, will have much greater artistic cachet. But in both cases the memorabilia from these artists can be very collectible. The key to turning an album into valuable memorabilia is to buy from a respected artist who is at least moderately successful and produces their latest release on a limited run. There also has to be a high demand for the album on its release, and for this demand to continue and outstrip supply, in order for the memorabilia to rise in value. By contrast, multiple formats from hugely popular artists who aren’t critically regarded aren’t a worthwhile investment. As a general rule these artists only produce their albums on CD. In those rare instances when they are teamed with a book, so many will be produced that any increase in value is highly unlikely. An album that was first released in the vinyl era might well also have appeared over the years on 8-track, cassette and CD. Collecting all formats is probably strictly for hard-core fans, although rare vinyl and 8-tracks in excellent condition do have value. There has even been a surprising, but small, return in the cassette market. Where there is real rarity – when a CD pressing of the disc has gone out of print, for example – then there can be a worthwhile rise in value. Again, it’s a case of selecting the right artist and also making sure that anything you buy is in near mint or mint condition in order to realise good prices. If you have an album in all formats it would be much more valuable to sell these items as a collection rather than individually, as they’ll go to a real collector interested in investment and thinking in the long term. The problem is that only a serious collector will have amassed the collection in the first place and probably won't want to part with it. Real fans of a particular artist are going to want releases in all formats; that’s simply a part of the collecting bug. Often a collector might buy two copies of one format, most likely CD, so they can use one to listen to and keep the other as part of the collection. It’s unlikely that these collections will be broken up until money is desperately needed or the collector dies. By contrast, the investor is searching for something that will make money, even if it’s in the long term. In this case the formats will all remain in mint condition and be kept safely for future sale. It’s worth being reminded that these investments won’t always make money. Things do change, artists go out of favour for example, and any number of factors can intervene. That said, choosing the right artist and collecting a release in all possible formats, especially where some are limited editions, is generally a wise move and will reap benefits, sometimes in as little as two years. If funds are limited, opt for the format that is available in the smallest quantity, as this will see the greatest appreciation. This maximises your resources, even if you won’t make as much as you would from the complete set of formats together. Should You Collect Reissued Vinyl? Sheet Music: Is it Memorabilia? Re: Kendo Nagasaki's Mask, Could it be Valuable?